It is no secret that a bathroom and kitchen tend to have a trendy following. Assume this, you might have invested $24,000 in an authentic Mahogany fence and no one bats an eye. But, you invest the same on custom kitchen cabinets in Vaughan or a new shower and everyone comes around to ask. So, basically, kitchens and baths matter, and are undoubtedly the two most used aspects in every human life. Further, a remodeled bathroom or a kitchen is great for improving a home’s retail value. However, if you have budget chances are you cannot invest in both remodeling a bath along with a kitchen. In such cases, you need to weigh out the options; invest in custom kitchen cabinets in Vaughan, or go for a remodeled bath? Well, to help you sort out, this article can help. The basic kitchen remodeling project costs up to $19,000, and completely remodel for larger projects can go up to $57,000. On the other hand, a mid-range bathroom remodels cost around $17,000. However, extra additions can cost up to $40,000 if you’re saying altering and adding 48 sq. feet space. For larger bathrooms, the cost can even exceed that of $50,000. 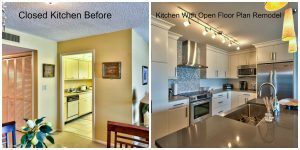 Complete Kitchen remodels can take up to 6 months to a month. However, if you’re including just custom kitchen cabinets in Vaughan, then renovations can be complete in a few weeks. Bathroom renovations generally take up to 18 days for mid-sized washrooms, while a larger one can take up to a month. When it comes to renovating purposes, an investment in custom kitchen cabinets in Vaughan is undoubtedly less disruptive. Alternation of the bathroom requires breaking down of the bath for almost a month. You might have to face the inconvenience of using a shared toilet, as disruptive bathrooms cannot be used. On that note, if you consider investing in kitchen remodeling via changing cabinets, you are not only changing the appearance of the kitchen but also, saving on lots of inconveniences. You need to contemplate your needs when it comes to renovating the bath or kitchen. Do you want a haven to retreat and relax? If so the opt for renovating the bathroom. However, if you have a passion for cooking, then improve the ambiance of your kitchen to boost motivation. Which is Better for Resale? Last, but not the least the most important factor to consider is whether your home’s retail value will boost due to bathroom or kitchen renovation. As per Consumer Reports, 52% real estate professional consider that a kitchen is most important when it comes to boosting retail value. On the other hand, 42% consider the bathroom to be important. The kitchen undoubtedly is the heart of the home and is mostly the place where the Realtor sets up his/her camp during open houses. Thus, all things considered, if you have a stringent budget and yet wish to bolster your home’s retail value, it is best to invest in custom kitchen cabinets in Vaughan. This will make your home look chic, and add satisfactory retail value to it. ← Why Is Diamond a Popular Choice for Diamond Rings?